Your pet would love to join the team in this No.12 jersey! 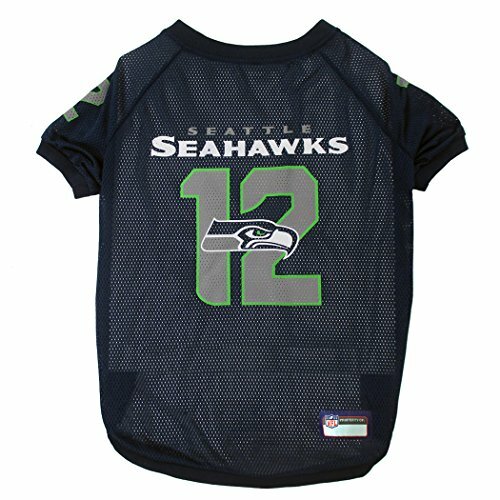 This jersey honors the 12th man in football; the fan who watches every game and sticks with their team through wins and losses. It is designed using durable poly mesh materials just like the pros. The jersey has a vee neck front with ribbed band bottom for easy fit. The jersey features a screen printed team logotype, a large No.12 on the back and a woven jock tag sewn on the bottom for personalization. No.12 is screen printed on both sleeves with a 1x1 trim. For sizing specifications, please follow these guidelines: Xsmall: for a dog measuring 6"-9" from the nape of the neck to the base of the tail. Small: for a dog measuring 8"-12" from the nape of the neck to the base of the tail. Medium: for a dog measuring 14"-18" from the nape of the neck to the base of the tail. Large: for a dog measuring 20"-24" from the nape of the neck to the base of the tail. Xlarge: for a dog measuring 26 Inch to 30 Inch from the nape of the neck to the base of the tail.